Have you ever heard of Menudo? 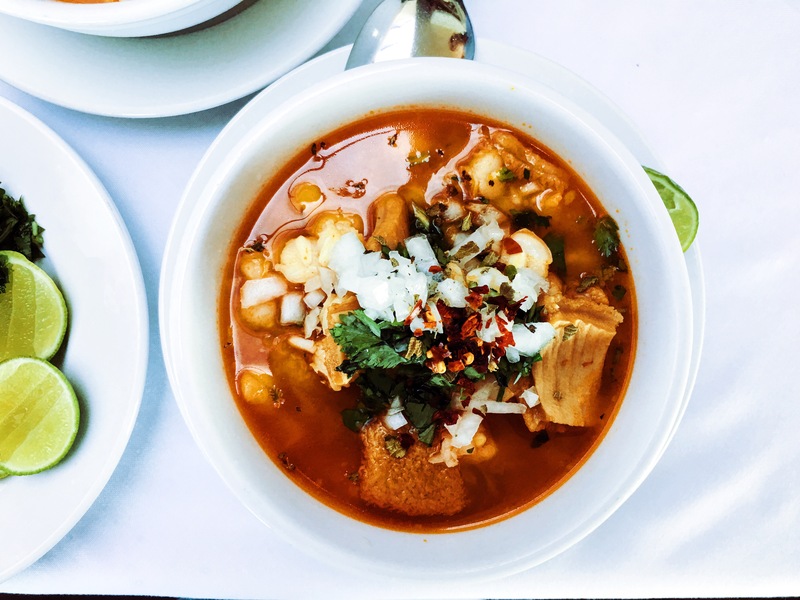 Or you probably heard about “Tripe & Honeycomb meat”, yes, I know, it is something that your grandparents used to eat and it used to be popular in England years ago, well in Mexico, Menudo, still very popular and in fact it is believed to cure hangovers and it is cooked in special occasions. In my family we usually cook Menudo for New Year, we all gather on the 1st day of the year and eat menudo. It is done the day before, because it takes a few hours to cook, but once it’s done, it tastes divine, despite the meat texture. There are different versions for this stew depending on the region in Mexico that one is. 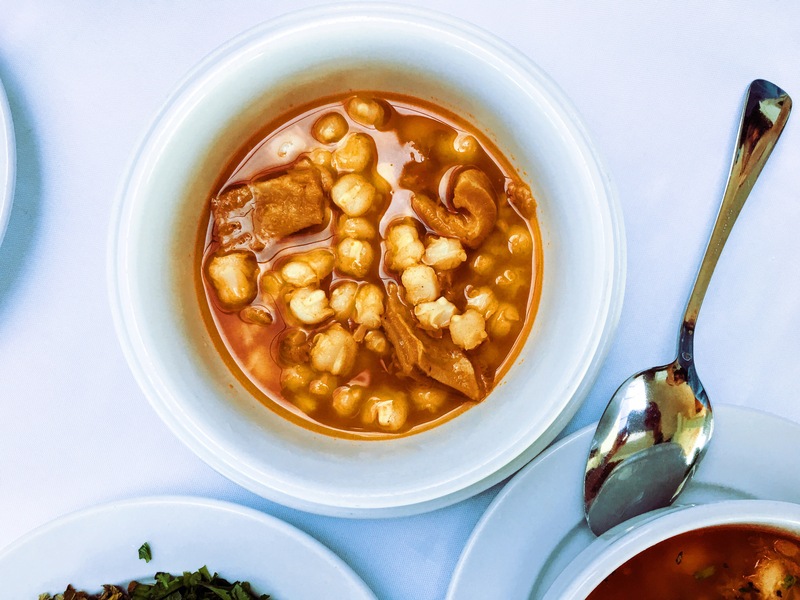 In northern Mexico, typically hominy is added. In Northwest states such as Sinaloa and Sonora it is eaten white, no guajillo sauce is added. Adding patas (beef or pigs feet) to the stew is popular in the U.S. 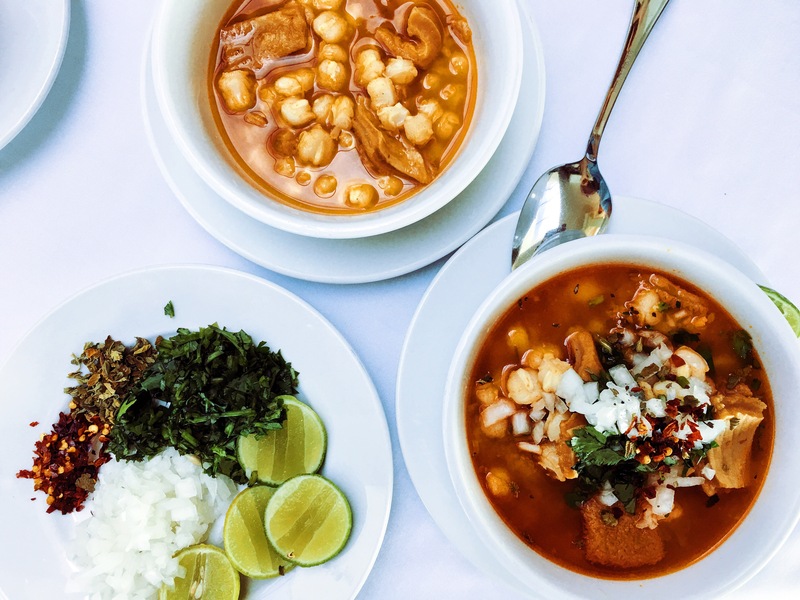 In some areas of central Mexico, “menudo” refers to a stew of sheep stomach, “pancitas” stew of beef tongue. In South-Western Mexico (in and around the Distrito Federal, Morelos, and Guerrero) it is called “panza”. The red variation is usually seen in the state of Chihuahua. In my family we cook it white and with hominy added, but sometimes we do it red. So today I will share with you both versions. I hope you give this dish a try, see beyond the funny texture of the meat and you will discover a lovely, amazing and packed with flavour stew! I assure you, you will love it. Here my inglés absolutely adores it, so if he likes it, you will definitely love it. First blend an onion and garlic cloves. Then in a large casserole dish, put the beef feet to cook in plenty of water, adding the onion and garlic mix. Add a tbsp of dried oregano. Cook in medium-low heat until the feet look that they are burst, it usually takes around 1 hr and a half. In the meantime prepare the guajillo sauce. Take the stems and seeds off, clean the dried chillies and cook them in water adding the tomatoes and 1/2 onion. Once the chillies are soft, place the chillies, tomatoes and onion in a blender, adding just a bit of the water where they were cooked. Blend them until getting a smooth sauce. Set aside. Once the feet are cooked, add the tripe and honecomb meat, cook for 1 hr and add salt to taste, then add the guajillo sauce and continue cooking for 15 min. Then add the hominy and cook for another 20 min. Taste the stew before turning the heat off. Once is cooked, serve it with chopped onion, coriander, dried chillie flakes, pinch of oregano and squeeze of lime. Place on the table some white bread (birote, ciabatta or white bread). First blend an onion and garlic cloves. Then in a large casserole dish, put the beef feet to cook in plenty of water, adding the onion and garlic mix. Add a tbsp of dried oregano and the green pepper. Cook in medium-low heat until the feet look that they are burst, it usually takes around 1 hr and a half. Once the feet are cooked, add the tripe and honecomb meat, cook for 1 hr and add salt to taste.